This afternoon was the season AND home opener for the Toronto Blue Jays ... and Gord and I were there! Yay! The Detroit Tigers are in town this weekend for four games. Everyone attending today's game was given a free shirt as we came in the gates. There was an AI batting game ... and Gord gave it a go. Jamie Campbell and others were broadcasting before and after the game. Former Blue Jays player and Hall of Famer, Jack Morris, threw out the ceremonial first pitch. The managers of the two teams met with the umpires. Here's the view from our seats in section 123. Here's the Blue Jays' starting line-up. Ace paid tribute Freddie Mercury ... note the moustache. Ace also waved a huge flag towards the end of the game. There were three big contests and none of the participants were correct and won ... but they still went home with the big prizes. 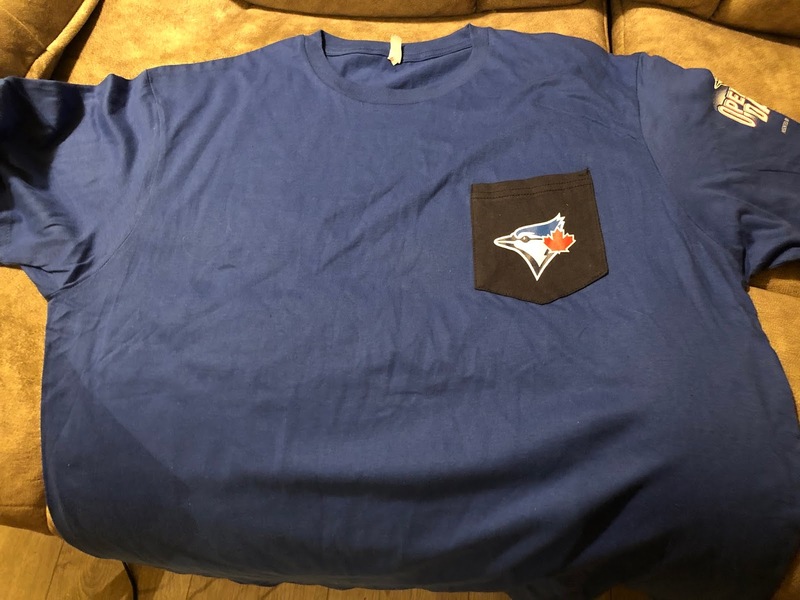 One woman was given a trip to Barbados, a man was given a Honda lawnmower which, for some reason, was upgraded to a 2019 car, and a family was given 2019 Blue Jays season's tickets. The game went into an extra inning. Going into today's game, the Blue Jays had lost their last seven home openers ... alas, today's game was number eight.